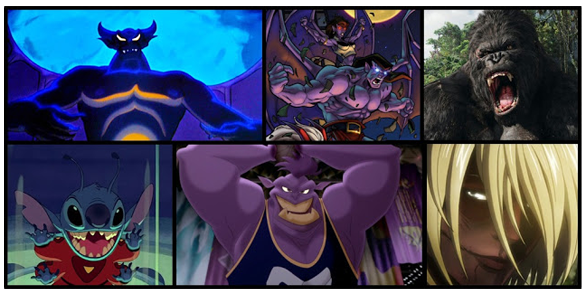 Creepy, crazy, mysterious, dynamic - these are just a few words to describe the plethora of animated monsters we have enjoyed in films and television shows over the years. From the colorful halls of scream factories to the fires of Bald Mountain, these crazy creatures thrive in the darkest and silliest corners of our imaginations. So, without further ado, let's take a look at some of the best of the best. Let us know who your favorite monsters are in the comments below. Say "Hello, Beastie!" Kicking off this list of monsters is the king of beasts himself: King Kong. Since his first appearance in 1933, the giant gorilla has become a media icon, having appeared in films, comic books, video games, and even a cartoon series. Originally, Kong was animated via stop motion effects, but I believe we can all agree that his incarnation in Peter Jackson's 2005 epic masterpiece King Kong is the best, by far. Animated through motion capture (provided by Andy Serkis), this Kong was strikingly humanlike, with soulful eyes and a powerful presence. Although his versions have varied over the years, Kong has often filled the role of antihero, a creature snatched from his home and dropped in the middle of a dangerous, cruel world. Eventually, the hunter becomes the hunted, and what results is a tragic death at the hands of his human captors. Much like the Gremlins from the cult classic film Gremlins, the aliens from Warner Bros. sports adventure Space Jam prove that you should never judge a book by its cover...ever! At the start of the film, they start out as Nerdlucks, disgustingly cute little creatures who resemble mish-mashed hybrids of beetles and plush toys. After absorbing the powers of famous NBA players (weird plot twist), these diminutive aliens undergo a gruesome metamorphosis and transform into hulking alien beasts called Monstars. Physically powerful and extremely cocky, these intimidating bad boys are a ton of fun to watch. They are funny, as well, having a lineup of expressions that are pure comedic gold. Plus, their transformation sequence is one of the most epic scenes I have ever viewed in a 2D animated film. Monsters they may be, but the Gargoyles from the famous Disney Afternoon series proved to be far more than creatures of darkness. They were noble warriors who defended ancient castles in Medieval Scotland and the steel jungles of Manhattan in the 1990s. Having a diverse backstory involving an ancient curse and mass genocide, the Gargoyles were awesome to behold. Their edgy, demonic designs blended perfectly with their unique personalities. And, like the Monstars, their transformation sequence from stone to flesh is absolutely epic! 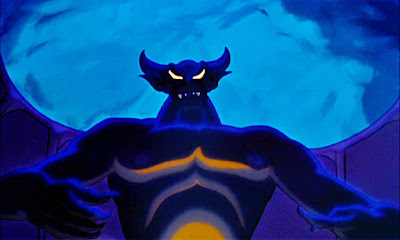 If you tried to imagine what the Devil looks like, you would probably think of Chernabog, the black death god from Disney's musical masterpiece Fantasia. This diabolical demon is the spawn of nightmares, and it is not hard to see why. In the "Night on Bald Mountain" number, Chernabog emerges from his deep slumber to play god with the dead on Walpurgis Night (Halloween), his fingers casting long shadows across the land as he extracts souls from moats, cemeteries, and other creepy crevices. Possessing a huge wingspan, curved horns, sharp teeth, and glowing eyes, this devilish devil never spoke and never moved much. Chernabog just existed...to scare us to death. Fairly new additions to the world of animation, the monstrous Titans from Attack on Titan (Shingeki no Kyojin) manga represent the worst of humanity, but watching them lumber about in the anime series is utterly terrifying. Ranging from 10 to 200 feet in height, these giant monsters wiped out the majority of humanity and prey upon the surviving humans, who cower behind massive stone walls they believed to be their only means of protection. What makes them especially terrifying is their mysterious history and biology and the fact that they do not possess any logic, making them bloodthirsty animals. Voiced by Ken Page, the smooth-talking Oogie Boogie is the stuff of nightmares. The creepy Boogey Man of Halloweentown is a con-man and lowbrow criminal who constantly wreaks havoc on the locals with the help of his trick-or-treater henchmen (or is that hench-children?) Lock, Shock, and Barrel. He sings one of the most iconic songs in the movie and also attempts to murder Santa Claus and Sally the rag doll. Creepy and kooky, Oogie was one mean customer, and we enjoyed every moment he was on screen. Except for the moment when Jack unravels his burlap covering to reveal those glowing green sentient bugs. Yipes! The stars of Disney/Pixar's Monsters Inc. might not be the scariest monsters on this list, but they are still awesome monsters nonetheless! The top scare team at Monsters. 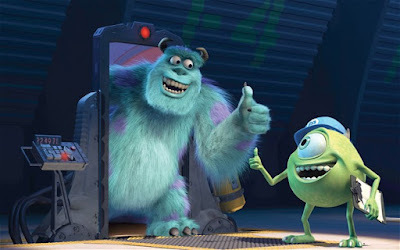 Inc., Mike and Sully are two out of thousands of monsters who collect children's screams which are converted into an energy source, and they absolutely adore their jobs and all the praise they receive. Once a human toddler enters the picture, however, hilarity ensues as Mike and Sully try to get her back to the human world. Sully (voiced by John Goodman) is a delightful blue hairball with a heart of gold, and Mike Wazowski (voiced by Billy Crystal) is a one-eyed comic relief figure whose short stature is outmatched by his enormous ego. Gossamer is one of those bizarre creatures who teeters on the fine line between creepy and funny. He is an enormous monster covered in red fur from head to toe and bears a striking resemblance to a certain Addams Family cousin. Often clashing with Bugs Bunny, he attempts to be a scary beast but never succeeds, always falling prey to the antics of that "wascally wabbit". Adding to his strangeness is his pair of white sneakers and his nearly featureless face. Once again, we have to ask ourselves...Is Gossamer creepy or funny? We may never know the answer, folks. Much like the Nerdlucks from Space Jam, Stitch is one of those aliens who looks adorable and packs a punch! Introduced in Disney's science fiction comedy Lilo and Stitch, this vicious blue extraterrestrial captured our hearts and made us cringe when he scampered across the silver screen. Since that time, he has become a major figure in Disney culture, even starring in his own anime series in Japan. So how can I describe the little guy? Picture a hyperactive child who just ingested a year's supply of coffee and candy. That person would be mild compared to the crazy ball of fluff and claws that is Stitch. A Frankenstein's monster of sorts, Stitch is a genetic experiment with a volatile temperament and incredible strength who crash lands on Earth and befriends a little Hawaiian girl named Lilo. One misadventure after another, the two become lifelong friends, and he is eventually accepted as a member of her family. Cute as a button and strong as a Kryptonian, Stitch is one little monster you are glad to have on your side.